To solve our nation�s political problems, we must first rebuild the public�s trust, argues Dan Yankelovich. "�She understood suddenly�that it was futile to work for political solutions to humanity's problems because humanity's problems were not political�The primary problems were philosophical, and until the philosophical problems were solved, the political problems would have to be solved over and over and over again." This insight applies particularly to the current plight of our democracy. Symptoms of its dysfunction are everywhere. Only about a third of eligible voters bother to vote in non-presidential elections. Congress is gridlocked and polarized. Our economy, our schools, our social mobility escalators, our health care, our social justice system � none of these core institutions of our democracy are working as well as they should for the majority of Americans. The American public knows something is wrong. For decades a majority of the public has been telling pollsters that the country is "on the wrong track." When we probe into what this means, people state that they don�t feel they have a voice in shaping the decisions that most impact their lives. They experience this lack of voice as a betrayal of the promise of democracy. People must trust their political institutions to seek the common good as well as their own interests. 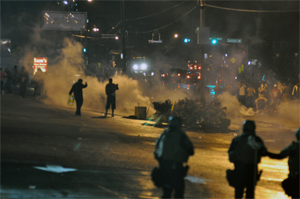 The town of Ferguson illustrates what people mean by a lack of voice. Months after a white cop shot and killed an unarmed black teenager in Ferguson, a grand jury voted not to indict the white cop. These events evoked anger, frustration and widespread looting, verging on anarchy. Ferguson had relied on the legal mechanics of democracy such as grand jury deliberations to deliver justice. The majority of Ferguson's citizens are black. They had learned to mistrust white control over the police and the legal system. When the crisis arose, there was no minimal bond of trust they could rely upon to initiate a healing process. The philosophical challenge requires that we recognize that democracy presupposes a minimal bond of community based on trust. Conflicting groups need a core of trust to engage in the kind of dialogue that might lead to healing. Building trust must always precede political tinkering. People must trust their political institutions to seek the common good as well as their own interests. The strategies for building trust are very different from the day-to-day strategies of the legal system. The town of Ferguson is not that different from thousands of other towns across America who place formal legal procedures ahead of trust-building. Robbins' insight is to grasp the reality that unless we first address the philosophical challenge of developing trust and community, "the political problems would have to be solved over and over and over again."